Tonya Keller of Greenville found the 1 millionth produced bottle of Rodeo Red produced by The Winery at Versailles. 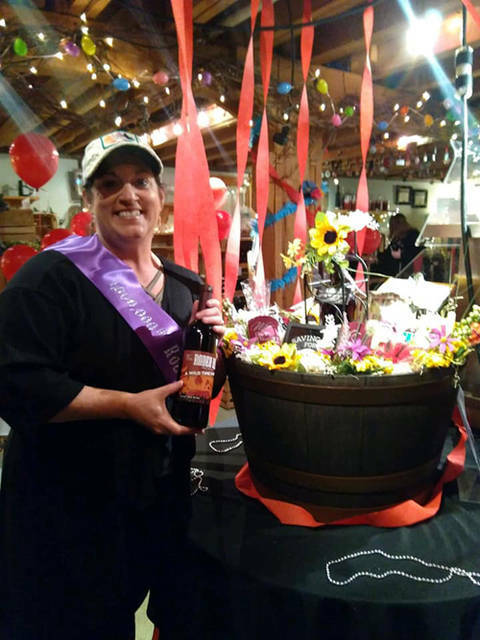 VERSAILLES – The Winery at Versailles congratulated Tonya Keller of Greenville on finding the 1 millionth produced bottle of Rodeo Red. It was hidden among more than 60 cases of Rodeo Red throughout the sales area, and customers spent the day hoping to find it. Many guests won Rodeo Red shirts as well as gift bags filled with winery goodies. Keller also won a huge gift basket that had to be carried out by two people filled with items donated by local businesses and friends of the Winery including The Winery at Versailles, Carlena Sneed, Amanda Enicks, The In at Versailles, K’s Catering, Drab to Fab, Asti Lane Designs, Mikesell Monograms, Heidelberg Distributing, The Merchant House and Creative Labels.